Kevin doesn’t have any friends. That’s hard for me to say out loud. He’s 11. He’s never been invited to a sleepover, never invited to a birthday party on his own accord or invited to come over and play at someone’s house. My kids don’t have school today and Brian asked if he could go out in the neighborhood. Kevin? He stays here with me. We play some games, read, toys, TV, movies, but this is his every day off. Just hanging out with mom. What hurts me the most is how much he loves to be around other kids. When Brian has friends over, he loves to be with them. He just sits on the sidelines, watching, smiling, enjoying the company. It’s no secret that many kids with disabilities struggle socially and struggle to build and maintain friendships. When Brian tells me stories of kids at school who sound like they have a disability of some kind, I always encourage (read: nag!) him to go the extra step. I encourage him to be extra patient and help that classmate, reach out to that classmate, invite them to eat with you, invite them to play on the playground. Because I know. I know how that mom feels. She knows that she is sending her baby off into the world where the only people welcoming him will likely be the adults. The ones who “have to” include him. And sometimes even that doesn’t happen. So it’s on us, as parents. We can get it put into their IEP, but we must spend an extraordinary amount of time and energy helping our kids develop social skills. Often when a child lacks social skills or social cognition, it is perceived to be cognitive and academic deficits. Moms, stick with your gut instincts and keep advocating. It may be as simple as a social story about making friends. If you haven’t noticed, I am updating a lot of old posts and combining information. Yesterday I attended a presentation from Tara of 2 B Social. When I first published this post, I felt uncomfortable with it. I have a real problem with society not accepting our kids. Why is it always the disabled kids’ fault that they have no friends? Why don’t we teach others to work harder at being friends with people who are different from us? Disabled kids already have enough on their plate. I brought this up yesterday. Good point. I’ll do both. But, still, as she pointed out, most kids are just being told “what to do” as far as social skills goals, and they do not have the base knowledge. I hadn’t seen this for a long time, and I liked it in Tara’s context. You need roots before you can have leaves. When you look at the social skills below, look at the roots of the tree. Match up each goal (that you are considering) to a tree root. Does the child have that skill? Then why are they being told to do something? For example, I’m just going to grab number 3 from the first section: During unstructured play (recess, choice time), _______will play (participate, share, follow directions/rules, take turns) with 1-2 peers for 10 minutes with no more then 1 adult prompt in 4 out of 5 opportunities as measured by teacher/staff data and observation. 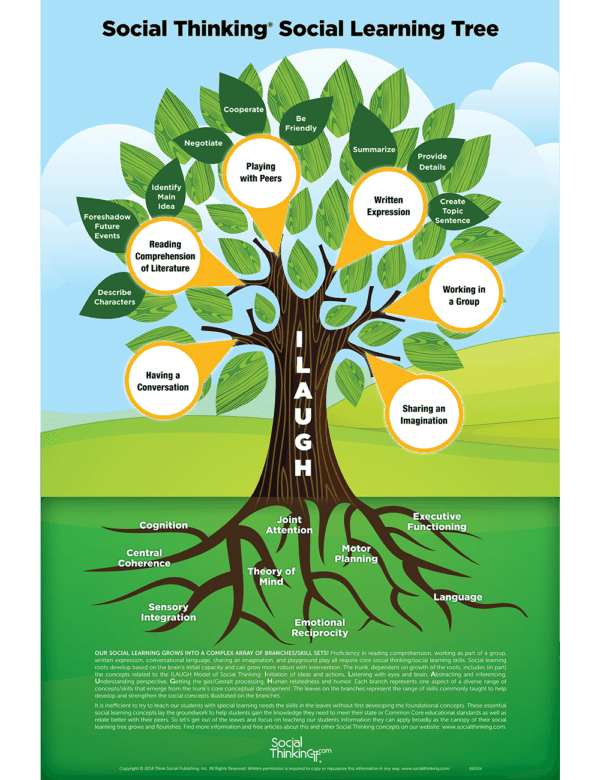 My child has limited cognition, very little language and no theory of mind–the tree roots necessary for this skill. So why am I asking him to do the leaves and branches activity of “playing with peers?” You cannot do the leaves and branches if you don’t have the roots. We have to go back. It doesn’t matter that he’s 11. If he doesn’t have the roots, he cannot do the other things. There is no algorithm for making friends, despite what Sheldon says. Yes, social skills should be worked on at school. There is no “oh that’s social skills, we only do academics here.” If it’s an area of need, it’s an area of need. 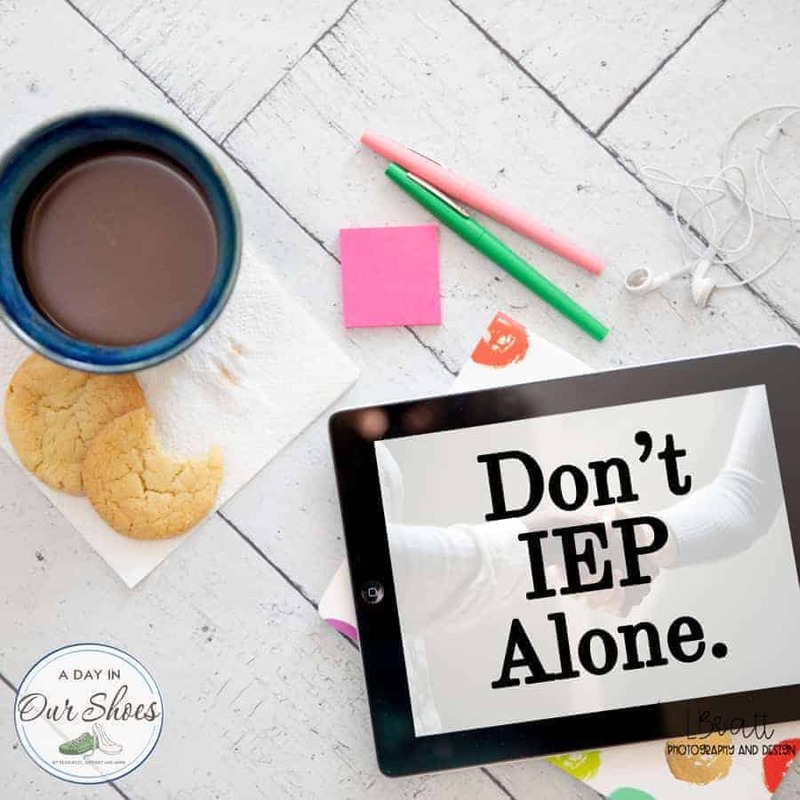 Use the IEP process and the PWN to get it on the IEP. But it is something that should be on your radar all the time, practicing and giving your child opportunities. Keep in mind you may have to alter some of these to make them measurable. But all can be quantified and measured. During unstructured play times, ______ will interact with peers in an appropriate manner through maintaining personal space and a respectful voice for an average 80% of intervals, measured over a 2 week period. _______ will decrease inappropriate verbal comments (such as “you are weird” or “you are a loser”) to 1 time per week or less by responding appropriately when his/her feelings are hurt (use words, talk to a teacher, walk away, stay calm) and seeking attention in appropriate ways (asking a friend to play, initiating conversation, giving a compliment) in 4 out of 5 trials as measured by teacher charted data. Given a pre-recess check-in with an adult, the student will identify the classmates she would like to get to know and greet them independently with 80% success across 3 consecutive weeks during recess. During recess, the student will initiate and begin a back and forth conversation exchange (for example, greeting and asking about a shared interest, such as a TV show, or asking if the peer enjoys crafts/art) with one of the previously identified classmates independently with 80% success across 3 consecutive weeks. Given a preferred activity, the student will invite one of her new “friends” to join her in a shared favorite activity during recess. (For example, the student will invite the friend to join her in making rainbow band bracelets or in drawing with sidewalk chalk in the designated area of the playground). Student will participate in this activity with a peer for at least five minutes during recess with 80% success across 3 consecutive weeks. While engaged in a shared activity, the student will comment, ask questions appropriate to the activity, and respond to questions or comments provided by the peer for 5 conversational turns with 80% success during recess across 3 consecutive weeks during recess. Making friends – Attend one event a week where I’ll have a chance to meet new people. Feeling less awkward around people – After certain social interactions, inspect (trouble shoot, self identify) the thoughts that came up during and after it. Troubleshoot the ones that are negative and maladaptive and list 3 alternatives. Improving conversation skills – Strike up a quick conversation with three people a day. Making friends – Meet two potential new friends and start spending time with them at least once every two weeks. Facing a fear of big events – By the end of three months, be able to attend a house party and stay for at least two hours. Feeling less awkward around people – Come up with a 1-10 scale for how uncomfortable and nervous you feel in social interactions. Over the next three months record how you felt during certain interactions and move the average rating down from an 8 to a 4. Improving conversation skills – Be able to have a half-hour conversation with someone you haven’t talked to much before, and subjectively rate yourself as feeling confident throughout it. If that is what your district does. ________ will develop social understanding skills as measured by the benchmarks listed below. _____ will raise their hand and wait to be called on before talking aloud in group settings 4/5 opportunities to do so. _____will work cooperatively with peers in small group settings (ie. Share materials, allow peers to share different thoughts) 4/5 opportunities to do so. _____ will develop an understanding of the relationship between his/her verbalizations and actions/effect on others 4/5 opportunities to do so. _____ will engage in appropriate cooperative social play interactions initiated by others 4/5 opportunities to do so. _____ will engage in cooperative social play interactions by allowing others to make changes or alter the play routine 4/5 opportunities to do so. _____ will engage in appropriate turn-taking skills by attending to peer’s turn and waiting for own turn 4/5 opportunities to do so. _____will appropriately acknowledge an interaction initiated by others by giving an appropriate response, either verbal or non-verbal. _____ will increase social awareness of the environment by stating what is taking place in the environment or imitating actions of others 4/5 opportunities to do so. _____ will increase safety awareness by stating the effect of various situations 4/5 opportunities to do so. _____ will identify appropriate social rules and codes of conduct for various social situations 4/5 opportunities to do so. _____ will refrain from interrupting others by exhibiting appropriate social interaction skills 4/5 opportunities. ________ will increase social-emotional skills as measured by the benchmarks listed below. _____ will identify various emotional states in others 4/5 opportunities to do so. _____ will state why a person might be feeling a particular emotion 4/5 opportunities to do so. _____ will identify various simple emotional states in self 4/5 opportunities to do so. _____ will state why he/she might be feeling a particular emotion 4/5 opportunities to do so. _____ will state what would be an appropriate response to a particular emotional state 4/5 opportunities to do so. 3.____ will increase social communication skills as measured by the benchmarks listed below. _____ will initiate communicative interactions with others 4/5 opportunities to do so. _____ will initiate varied appropriate topics with others 4/5 opportunities to do so. _____ will initiate communicative interactions with others by asking questions 4/5 opportunities to do so. _____ will engage in conversational turn-taking with others across 3-4 conversational turns, 4/5 opportunities to do so (topics initiated by self /others). _____ will call attention to communicative partner prior to communicating 4/5 opportunities to do so. _____ will ask questions of others regarding topics initiated by self or others to sustain a conversation for conversational turn-taking 4/5 opportunities to do so. _____ will identify and understand various non-verbal social communication behaviors (ie. Tone of voice, personal space, vocal volume, body orientation, facial expressions) by stating their implied meaning 4/5 opportunities to do so. _____ will spontaneously seek assistance/ ask for help/ seek additional information given visual prompts 4/5 opportunities to do so. _____ will spontaneously use a verbal or non-verbal message to indicate to the speaker that he needs additional “wait” time to process information editorially 4/5 opportunities to do so. _____ will identify breakdowns in communication and make appropriate adjustments 4/5 opportunities to do so. ____ will increase narrative discourse skills to objective criteria as measured by the benchmarks listed below. _____ will state the main idea of the story, video or situation 4/5 opportunities to do so. _____ will relate information (ie. Past events, stories, situations, etc…) sequentially 4/5 opportunities to do so. _____ will identify what happened first, in the middle, and last regarding a previous read story, past event, or situation. When relating information_____ will provide an initial background statement, include referents, include important pieces of relational information and leave out irrelevant details. 5.____ will increase their ability to function appropriately within the school environment as measured by the benchmarks listed below. Given visual and verbal prompts, _____ will participate in tasks/ activities to completion by exhibiting appropriate behaviors, _% of the time. _____ will transition appropriately from tasks and activities and school environments _% of the time given visual and verbal prompts. _____ will accept changes in the routine/schedule by exhibiting appropriate behaviors given visual and verbal cues _ % of the time. _____ will follow classroom rules and directives given visual and verbal prompts _% of the time. _____ will independently ask to take a break given visual and verbal prompts _% of the time. Printable social stories about friendship. « The Ultimate IEP Goal Bank~1000s of Measurable IEP Goals and Objectives.